Step 1: Please visit http://support.dlink.com/downloads and download the Web management utility and firmware. Step 2: Open the Web management utility. Step 3: Click Discovery to locate the Web smart switch and select the IP address of the switch and then click Add to monitor list. Step 4: Once you have added the switch to the monitor list, select the IP address of the switch and then click Firmware Upgrade. Step 5: Browse to where you downloaded the firmware to in Step 1. Once you have located the firmware, you will then need to enter the password that has been set up on the switch. Click Start. Step 6: Once the firmware upgrade has completed, you will see Upgrade successful. Step 1: Click tools> Config Backup & Restore. The Config Backup and Restore Page opens. 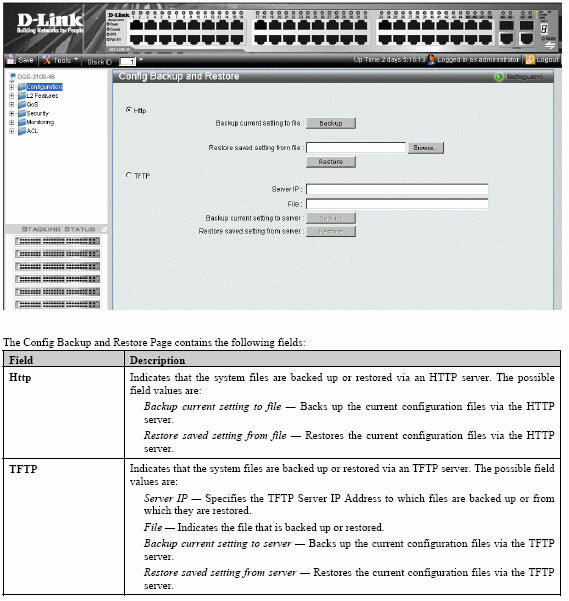 Step 2: Select HTTP or TFTP field. Step 3: Define the selected server method fields. To restore files, click restore. 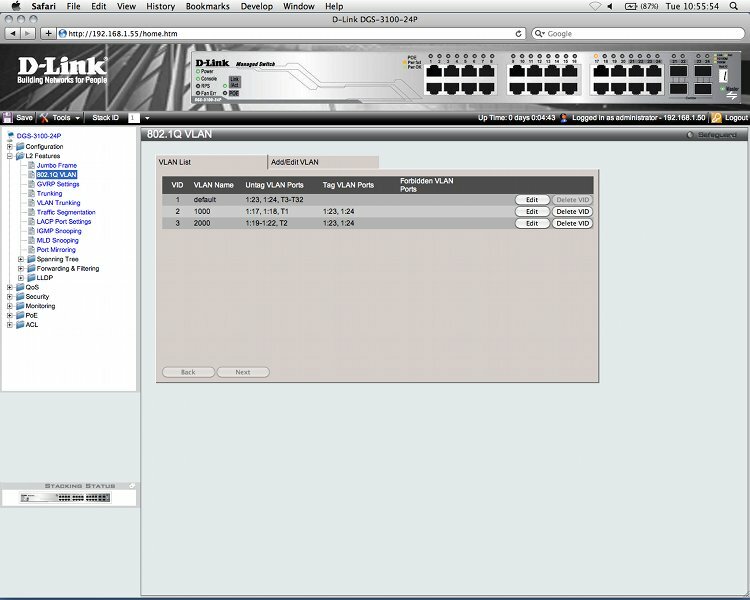 How to configure link aggregation groups for VLAN capabilities on D-Link DGS-3100-48P? D-Link DGS-3100-48P,If you are using the CLI then the below script should adequately demonstrate your requirements. create vlan 2000 tag 2000. 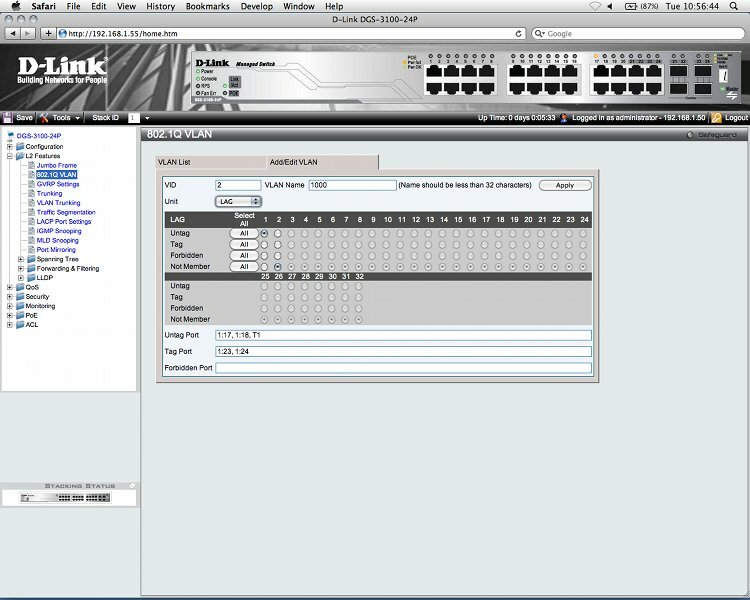 D-Link DGS-3100-48P,If you are using the HTTP GUI then you will need to ensure that from the VLAN configuration page you select the unit “Trunk” from the stack unit drop-down. 1 Q:Which wireless access points are compatible with both the DXS/DWS-3227 and the DXS/DWS-3227P wireless switches? 2 Q:What do I need to use my Access Points with my wireless switch? Step 1: A DHCP Server is required to be on the same Interface as the switch. Step 2: This line of switches utilizes Proprietary Access Points. provided from our DLink Sales Department. 3 Q:How many Access Points can be configured per switch? 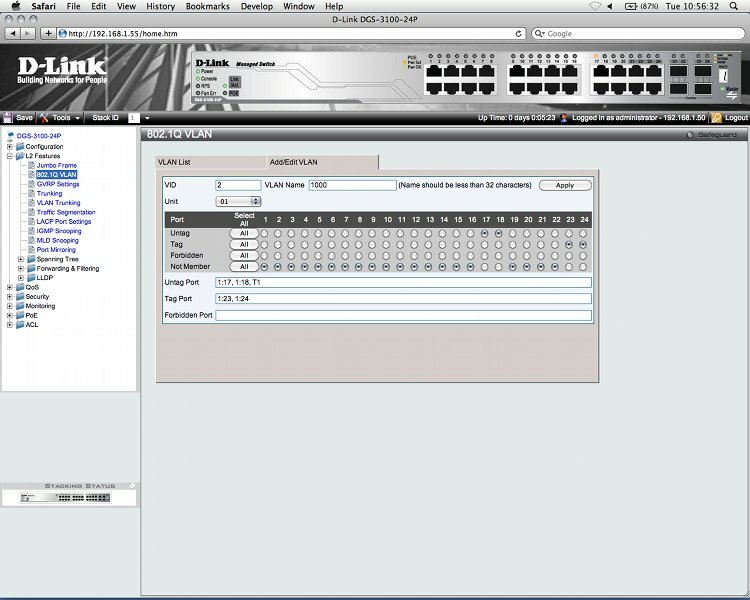 You can only configure 10 Access Points per switch. The DWS-3227/3227P/3250 comes with a 10 Access Point license. The DXS-3227/3227P/3250 requires the purchase of additional software to enable the wireless feature. Once enabled, the switch will support 10 Access Point (10 Access Point license included). 4 Q:What is the maximum number of Access Points can I configure per switch? You can configure a maximum of 50 access points per switch (with appropriate licenses), with Firmware version 1.0.1.109 or above. Note: If you have multiple switches in Stack Mode, the stack acts as one physical switch and will only support 10 Access Points. To add more Access Points, additional Licenses will be required (additional licenses sold seperately). You are also able to configure a maximum of 50 Access Points in Stack Mode. Your slave/backup switch will also require another License key to manage your access points if your master goes down. D-Link offers 25 and 50 User Licenses (sold seperately).